November 14, 2014 – Lehtinen Schultz PLLC is pleased to announce that the firm received a top-tier ranking in U.S. News & World Report and Best Lawyers “Best Law Firm” rankings in the Miami (South Florida) metropolitan market. 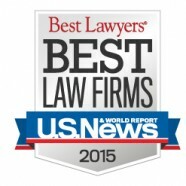 The U.S. News – Best Lawyers “Best Law Firm” rankings are based on a rigorous evaluation process that includes the collection of client and lawyer evaluations, peer review from leading attorneys in their field, and review of additional information provided by law firms as part of the formal submission process. To be eligible for a ranking in a particular practice area and metro region, a law firm must have at least one lawyer who is included in Best Lawyers in that particular practice area and metro region.